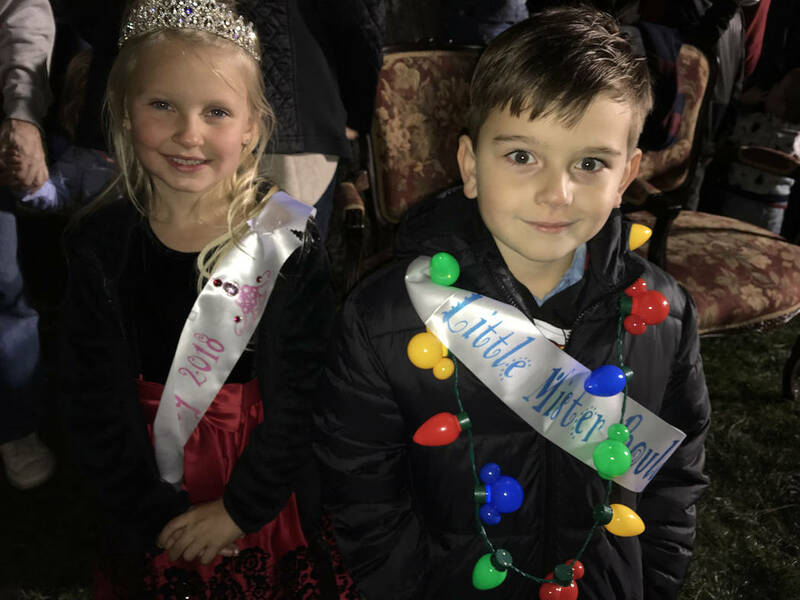 (Hali Bernstein Saylor/Boulder City Review) Little Miss Boulder City Meghan Shuman, 6, and Little Mister Boulder City Flynn Reiman, 5, helped Jingle Cat light the city's official Christmas tree Friday, Nov. 30, during holiday festivities in Frank Crowe Park. (Hali Bernstein Saylor/Boulder City Review) Santa and Mrs. Claus were joined by Jingle Cat and her new friend, Hoover the Dam Dog, who was rescued from the Boulder City Animal Shelter, for the city's official Christmas tree lighting festivities Friday, Nov. 30, 2018, in Frank Crowe Park. (Hali Bernstein Saylor/Boulder City Review) Terry Petty of Boulder City, left, gets some assistance from Ronnie Tice of Charmed as she tried on a bracelet during the 44th annual Doodlebug Craft Bazaar on Saturday, Dec. 1, inside the city's recreation center. (Val Olsen/Boulder City Review) Faith Christian Church hosted its annual Christmas cookie sale Saturday, Dec. 1 allowing people to get a variety of holiday treats without baking. 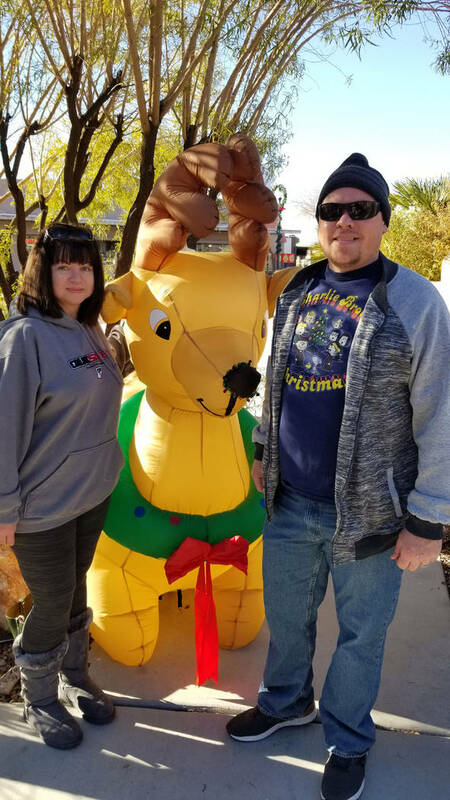 (Celia Shortt Goodyear/Boulder City Review) Michelle and Marcus Hillan take time for a photo with a Christmas reindeer at Breakfast with Santa on Saturday, Dec. 1. 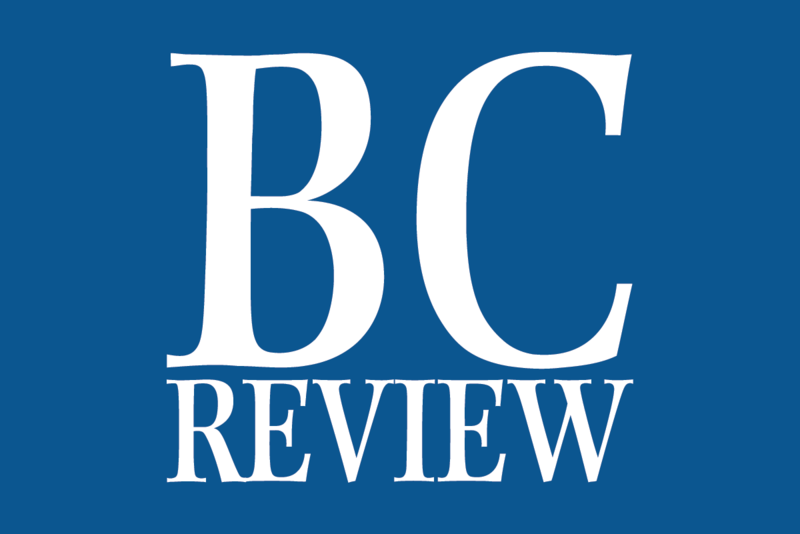 (Celia Shortt Goodyear/Boulder City Review) Christian Center Church held its first Pancake Breakfast with Santa on Saturday, Dec. 1. The event featured free food and a photo booth with Santa Claus. All proceeds went to the church's benevolent fund that helps the entire community. 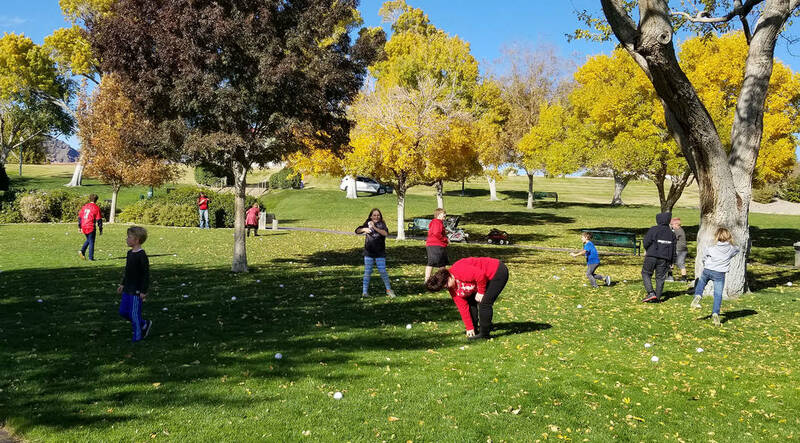 (Celia Shortt Goodyear/Boulder City Review) People had fun throwing stress balls at each other at the Community Snowball Fight at Wilbur Square Park on Saturday, Dec. 1. The event was a fundraiser for Boulder City Little League and sponsored by the Boulder City Family Mortuary. (Hali Bernstein Saylor/Boulder City Review) Kelly Flowers of the Rotary Club of Boulder City served hot chocolate to those who came to watch the city's Christmas tree lighting Friday, Nov. 30, in Frank Crowe Park. (Hali Bernstein Saylor/Boulder City Review) Janice Giannosa, secretary of the Boulder City Community Club, came to the group's annual Doodlebug Craft Bazaar on Saturday, Dec. 1, dressed as a Christmas tree. 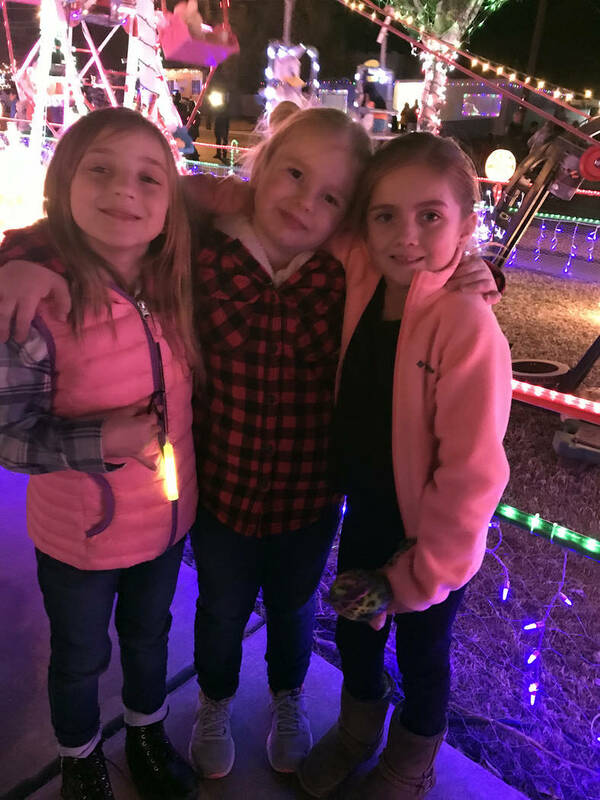 (Hali Bernstein Saylor/Boulder City Review) Friends, from left, Aviva Hnat, Mackenzie Brodowski and Lilliana Wrzalinski, were enjoying the festivities as the lights were turned on for the first time this year at the Christmas house on Fifth Street on Friday, Nov. 30. 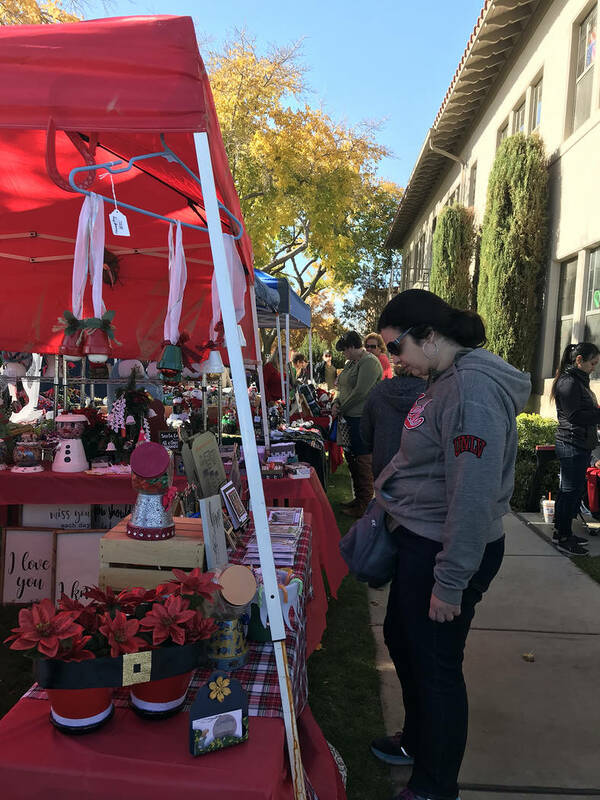 (Hali Bernstein Saylor/Boulder City Review) Boulder City Community Club presented the 44th annual Doodlebug Craft Bazaar featuring around 130 vendors Saturday, Dec. 1, 2018, at the Boulder City Recreation Center. 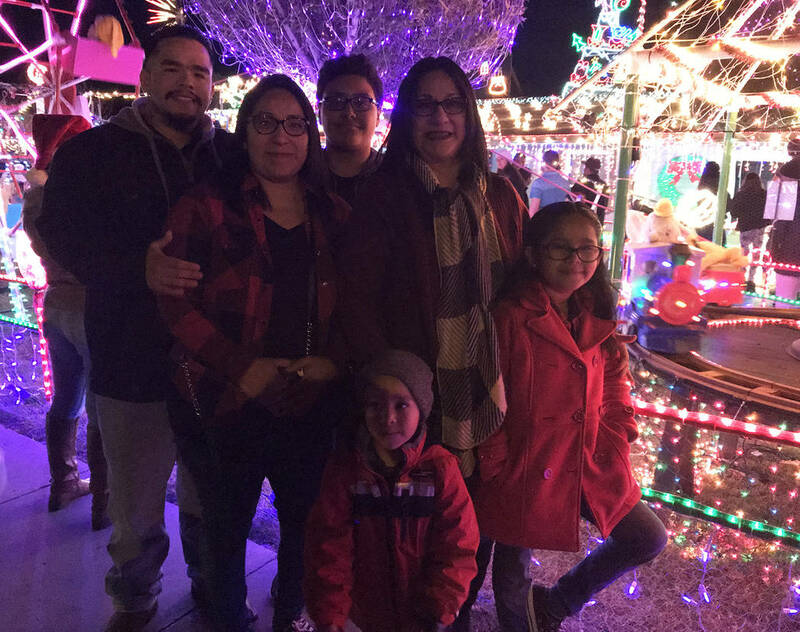 (Hali Bernstein Saylor/Boulder City Review) Among those watching the lights at 1525 Fifth St. come on for the first time this season on Friday, Nov. 30, were, from left, Jesse Rameriz, Cristina Rameriz, Alex Galvez, Lucy Acosta, Natalie Ramierz and Jonathan Rameriz, in front. (Hali Bernstein Saylor/Boulder City Review) Pamela Leon of 28 Sunflowers, left, takes a picture of Kiptyn Simposn of Boulder City, 7, as he visits with Santa and Mrs. Claus on Saturday, Dec. 1, during Santa's Picture Party presented by the Boulder City Chamber of Commerce inside the city's recreation center. (Val Olsen/Boulder City Review) Luke Davis and Elise Vanier portrayed Joseph and Mary during Boulder City United Methodist Church's presentation of the 30th annual Las Posadas and Luminaria on Thursday, Nov. 29. Michelle and Marcus Hillan take time for a photo with a Christmas reindeer at Breakfast with Santa on Saturday, Dec. 1. Christian Center Church held its first Pancake Breakfast with Santa on Saturday, Dec. 1. The event featured free food and a photo booth with Santa Claus. All proceeds went to the church’s benevolent fund that helps the entire community. People had fun throwing stress balls at each other at the Community Snowball Fight at Wilbur Square Park on Saturday, Dec. 1. The event was a fundraiser for Boulder City Little League and sponsored by the Boulder City Family Mortuary. 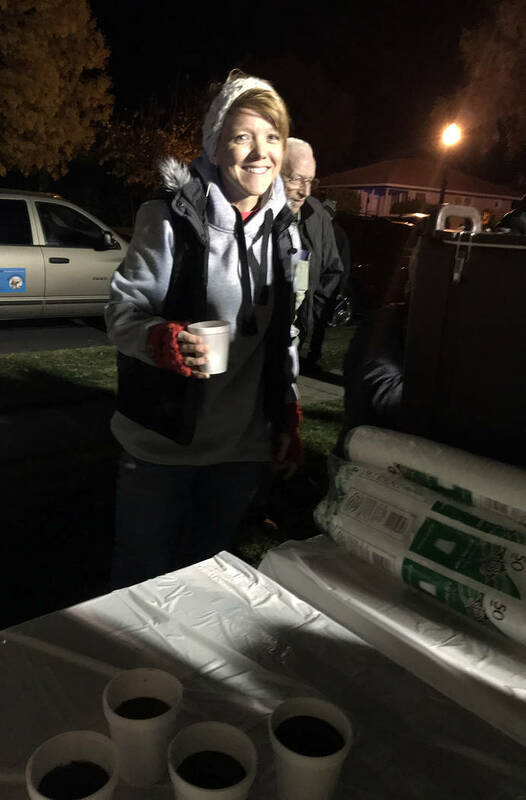 Kelly Flowers of the Rotary Club of Boulder City served hot chocolate to those who came to watch the city’s Christmas tree lighting Friday, Nov. 30, in Frank Crowe Park. 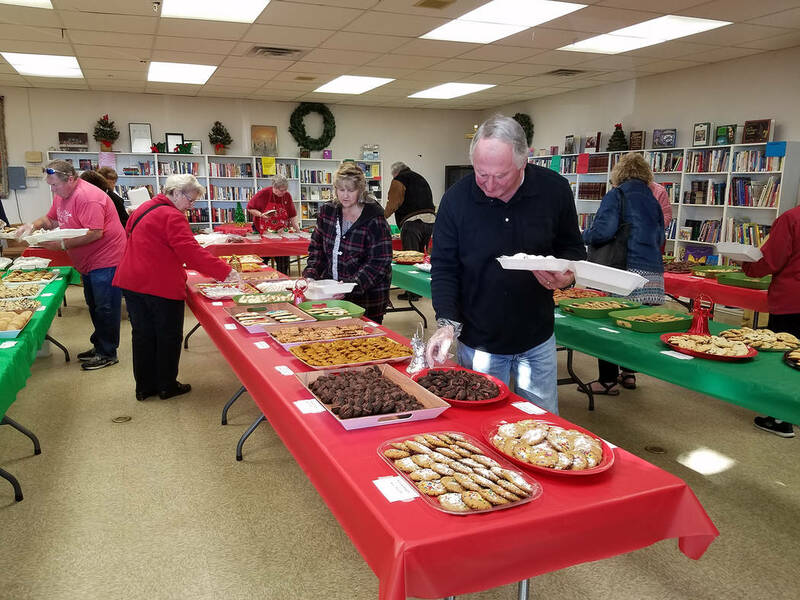 Faith Christian Church hosted its annual Christmas cookie sale Saturday, Dec. 1, allowing people to get a variety of holiday treats without baking. Terry Petty of Boulder City, left, gets some assistance from Ronnie Tice of Charmed during the 44th annual Doodlebug Craft Bazaar on Saturday, Dec. 1, inside the city’s recreation center. 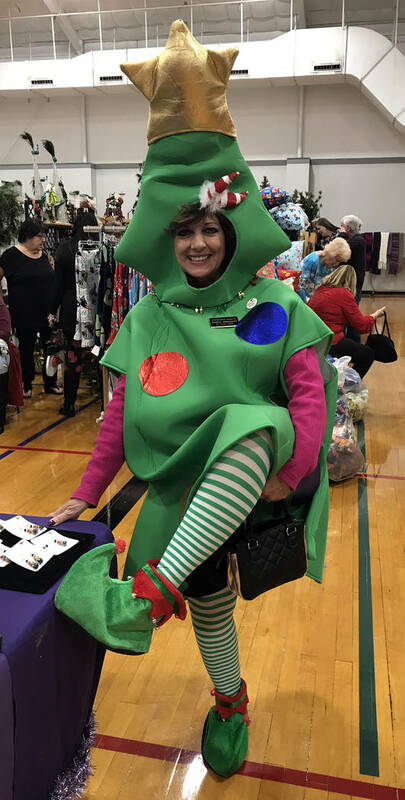 Janice Giannosa, secretary of the Boulder City Community Club, came to the group’s annual Doodlebug Craft Bazaar on Saturday, Dec. 1, dressed as a Christmas tree. 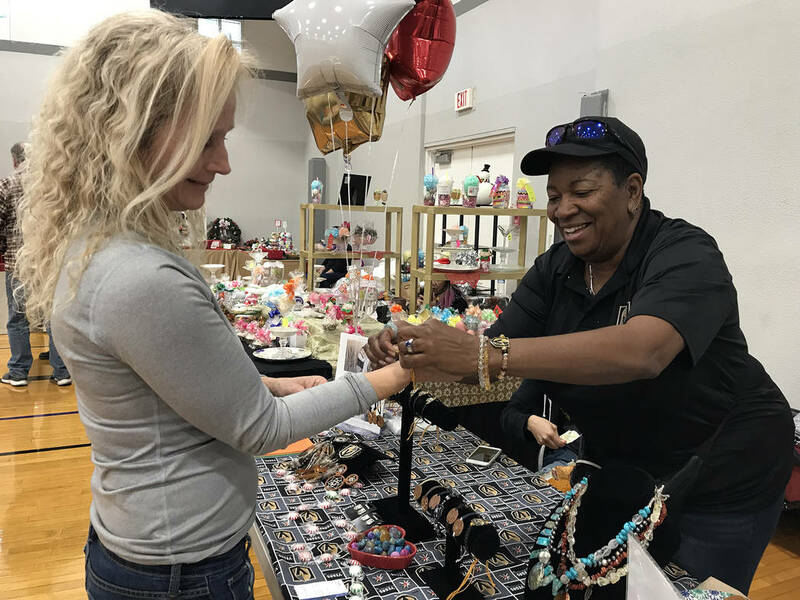 Boulder City Community Club presented the 44th annual Doodlebug Craft Bazaar featuring around 130 vendors Saturday, Dec. 1, at the Boulder City Recreation Center. Among those watching the lights at 1525 Fifth St. come on for the first time this season on Friday, Nov. 30, were, from left, Jesse Rameriz, Cristina Rameriz, Alex Galvez, Lucy Acosta, Natalie Ramierz and Jonathan Rameriz, in front. Friends, from left, Aviva Hnat, Mackenzie Brodowski and Lilliana Wrzalinski, were enjoying the festivities as the lights were turned on for the first time this year at the Christmas house on Fifth Street on Friday, Nov. 30. 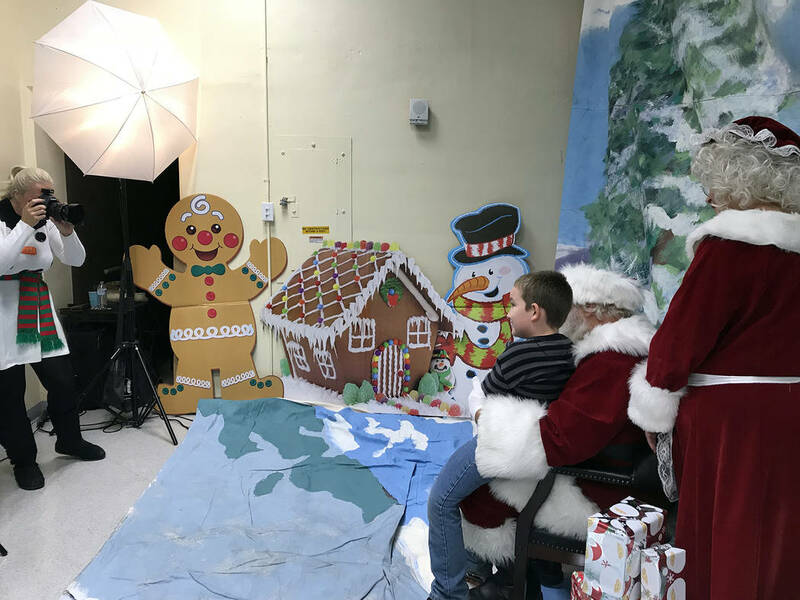 Pamela Leon of 28 Sunflowers, left, takes a picture of Kiptyn Simpson of Boulder City, 7, as he visits with Santa and Mrs. Claus on Saturday, Dec. 1, during Santa’s Picture Party presented by the Boulder City Chamber of Commerce inside the city’s recreation center. 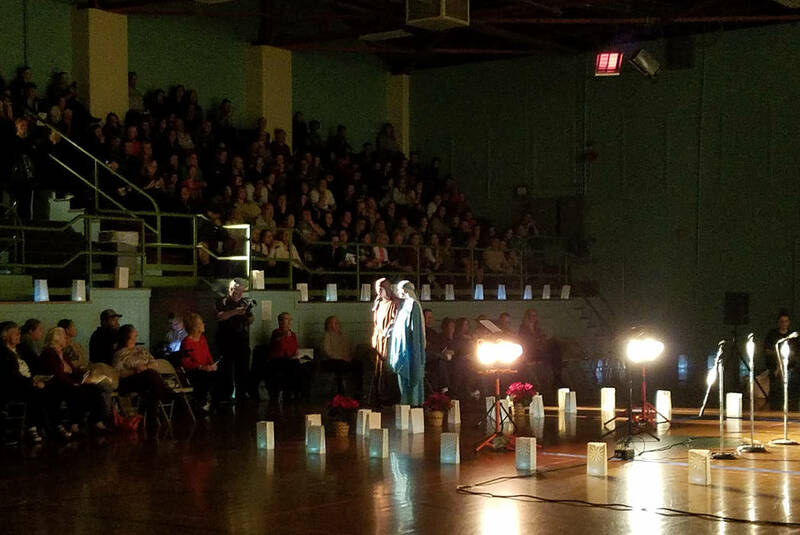 Luke Davis and Elise Vanier portrayed Joseph and Mary during Boulder City United Methodist Church’s presentation of the 30th annual Las Posadas and Luminaria on Thursday, Nov. 29. 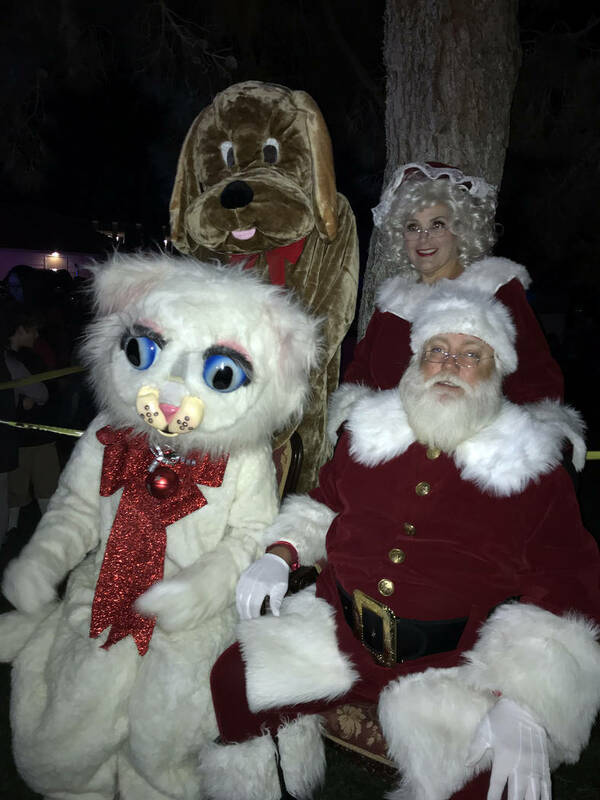 Santa and Mrs. Claus were joined by Jingle Cat and her new friend, Hoover the Dam Dog, who was rescued from the Boulder City Animal Shelter, for the city’s official Christmas tree lighting festivities Friday, Nov. 30, in Frank Crowe Park. 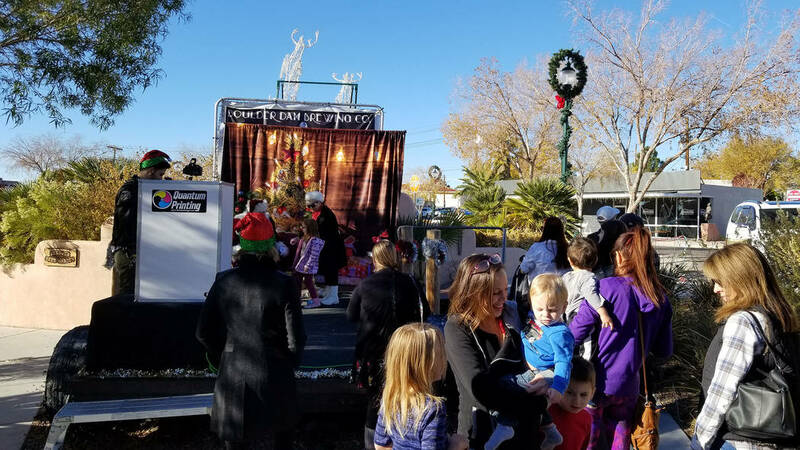 Little Miss Boulder City Meghan Shuman, 6, and Little Mister Boulder City Flynn Reiman, 5, helped Jingle Cat light the city’s official Christmas tree Friday, Nov. 30, during holiday festivities in Frank Crowe Park.